A car accident seven years ago stripped professional Hong Kong rock climber Lai Chi-wai of his ability to walk, but this did not stop him climbing up a mountain that is roughly the height of New York’s Empire State Building. 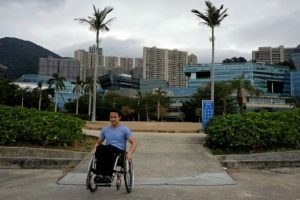 The 35-year-old, who is paralysed from the hip down, recently became the first Chinese athlete to be nominated for the Laureus World’s Best Sporting Moment of the month after he successfully scaled Lion Rock – a 495 metre tall (1624 feet)mountain which symbolizes a “Hong Kong spirit” of persistence, resilience and unity. The Laureus World Sports Award honours the best sportsmen and sportswomen of the year, as well as sporting moments of the month. The awards organisation was founded by Swiss-based luxury goods firm Richemont and German carmaker Daimler. Lai lost the December award to a viral video which showed a packed sports stadium of 70,000 people in Iowa turning and waving to children in an adjacent hospital. But he said he was surprised he was nominated to begin with, and hoped his story could inspire Chinese people and athletes with disabilities. “To me climbing to the top was accomplishing a dream of mine,” Lai said. A four-time champion of the Asian Rock Climbing Championships and the world’s first Chinese winner of the X-Game’s extreme sports, Lai climbed up Lion Rock on December 9, 2016, upon the 5th anniversary of the car accident. See more photos and read the full article here!